Can't decide between the city and the country? You get the best of both worlds at this Rahway hotel that boasts the best real estate around. 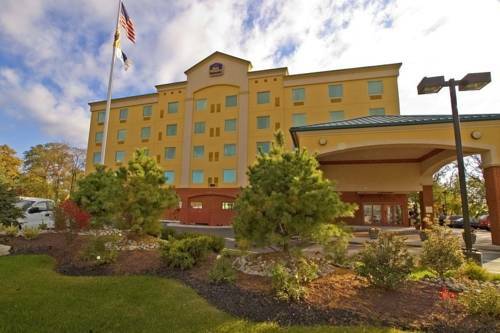 This Rahway hotel was built in 2004 and features all modern amenities and comforts. Near New York City, you can spend glam evenings in Manhattan sampling the endless decadent restaurants, and evenings tucked away in a quiet, comfortable hotel. You really can have a vacation where you get it all. You'll also be near Atlantic City and Great Adventures Amusement Park. See how your luck is holding up or opt for a guaranteed adrenaline blast. It's the perfect spot for an adults only vacation or family friendly fun. This Rahway hotel has an indoor pool, so there's no need to go far to relax. Nothing beats a little poolside lounging or indulging in a few laps on your vacation. There are a number of local restaurants to try. A variety of cuisines are just a stroll away, so start preparing your palate now. Take a walk to Liberty State Park after dinner for a romantic interlude. Rahway, New Jersey hosts an endless supply of entertainment, cultural activities, and adventure. You can also try the Rahway Train Station for a different way to travel. Many guests come to our Rahway hotel on business. A few travelers who call us their home away from home are employees of Merck Company, Sunbelt, and Advanta. Enjoy complimentary Internet access to get business taken care of. Wi-Fi isn't the only perk that's free. Our deluxe complimentary breakfast features hot waffles, yogurt, fruits, cereal, pastries and our gourmet 100% Arabica coffee. Reserve your next vacation at Best Western Riverview Inn and Suites, where location, service, and quality are top priorities! Enjoy your stay. 3.00 mile(s) from Bertucci, full service, Italian, open for: lunch, dinner, Sunday - Thursday 11:00 a.m. - 10:00 p.m., Friday & Saturday 11:00 a.m. - 11:00 p.m.
Across the street from Burger King, fast food, American, open for: breakfast, lunch, dinner, Sunday - Thursday 10:00 a.m. - 10:p.m. Friday & Saturday 10:00 a.m. - 12:00 a.m.
3.00 mile(s) from King Chef, full service, Chinese, open for: lunch, dinner, moderate price, Sunday - Thursday 11:00 a.m. - 10:30 p.m., Friday & Saturday 11:00 a.m. - 12:00 a.m.
2.00 mile(s) from Southern Smokehouse, buffet, American, open for: lunch, dinner, moderate price, Sunday - Thursday 11:00 a.m. - 9:00 p.m., Friday & Saturday 11:00 a.m. - 10:00 p.m.
4.00 mile(s) from TGI Friday's, full service, American, open for: lunch, dinner, moderate price, open 11:30 a.m. to 2:00 a.m.
2.00 mile(s) from Chevy's, full service, Mexican, open for: lunch, dinner, moderate price, Sunday - Thursday 11:00 a.m. - 12:00 a.m., Friday & Saturday 11:00 a.m. 1:00 a.m.
4.00 mile(s) from Red Lobster, full service, seafood, open for: lunch, dinner, moderate price, Sunday - Thursday 11:00 a.m. - 10:00 p.m., Friday & Saturday 11:00 a.m. - 11:00 p.m.
4.00 mile(s) from Jose Tejas, full service, Mexican, open for: lunch, dinner, moderate price, Sunday - Thursday 11:00 a.m. - 11:00 p.m. Friday & Saturday 11:00 a.m. - 12:00 a.m.
5.00 mile(s) from Seaport Aquarium Inc.